IF you have a good memory you will recall that a few weeks back I posted about a couple of little hair oils I had picked up for just £1 on my travels around Boots! 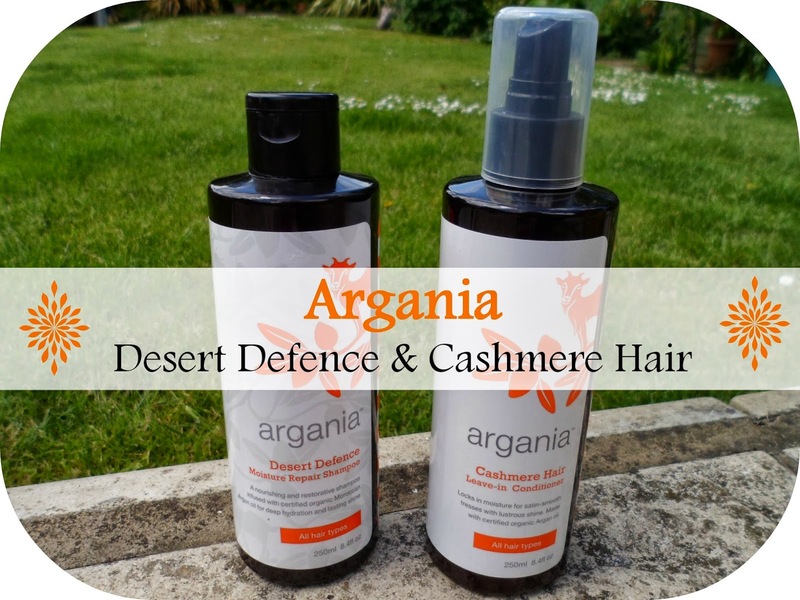 These were from the company called Argania and since seeing that little post by little old me the lovely people at Argania HQ have contacted me and kindly asked if I wanted to give anything else from their range a go. After having so much success with the oils and loving the results I jumped at the chance (umm... who wouldn't?) and was super excited to receive the Desert Defence Moisture Repair Shampoo and the Cashmere Hair Leave-In Conditioner to try out on my blonde locks! I've been really trying to look after my hair for the last couple of years as I have been growing it out from a bob and really want to keep it in the best condition possible! I have been through countless bottles of different shampoos and conditioners in this time and have been through most of the brands on the drugstore market - I'm always looking out for new ones to try out! The packaging for Argania has recently had a make-over so you may not recognise these but you most likely will recognise the old stuff - you can see everything here. I couldn't wait to start using these once I had got them so the day they arrived that evening I hopped in the shower and treated my hair to some Argania love. I was slightly nervous that just a leave-in conditioner wouldn't be enough for my dry barnet so I have been using a bit of my usual conditioner alongside the shampoo to make sure. Anyway here's what I thought about both! The words moisture and repair always have me excited when in relation to hair products! I'd say 99% of the time I am always looking for hair products which are specially for dry and damage hair, even if my hair is feeling okay - I just love the way they work! This Desert Defence shampoo has the lovely vanilla scent the same as the hair oils I reviewed before! It is very sweet so this may put a few of you and your noses off - but for me this is a bonus - I'm a sucker for anything that smells yummy! This lathers up lovely and feels great on the hair, you don't need alot of product aswell which is always good! Like I said before I have been using a little of my usual conditioner along side this ... I just don't feel right getting out the shower without it! I've found this shampoo online at Boots for only £7.50 - like I said before this is the new packaging so will look different to the things you see online at the moment. Out of the shower and I've been grabbing the Cashmere Hair Leave-In Conditioner and spraying it from the mid-ends of my hair and combing through! I love this stuff, again ti smells lovely like the others and feel so light - unlike other thick, heavy products! I'm not sure whether I could just use this on it's own as I think my hair is a bit thick. But it is perfect for using as an after wash treatment - it leaves my hair easy to comb through, smelling great and really smooth and shiny! If you have quick thin/fine hair and find conditioner leaves your hair limb, heavy and builds up then this alternative product would be perfect for you! Again this is available in the UK through Boots and is £9.99. Another 2 great products from Argania - I think it's time I invested in one of their conditioners to complete my set! Not only does this brand have an amazing scent but their gorgeous argan oil ingredient really does leave my hair softer and shinier! Hi, very helpful blog! I use Pro Naturals Argan Oil leave in on my curly, frizzy hair and it totally takes the frizz and leaves my curls shiny and soft.